Thomas Merton once spoke of God’s attitude towards us as one which is “Mercy within mercy within mercy”, and this is the lesson which we need to learn for ourselves, and to communicate to others. One of the most encouraging of verses in my opinion in the teaching of Jesus is when he beholds his disciples’ pathetic attempts at discipleship, and says: “Fear not, little flock, it is the father’s pleasure to give you the Kingdom.” (Luke 12.32) We can so often behave as if the Kingdom is something to be earned or to be industriously worked for – for ourselves or for others – and we forget that it is all Grace, and that being open to Grace in our own lives, and, under God, opening a channel for his Grace to others. Grace is one of those words, which would take many pages of Ad Clerum to address, so let me simply recall the mnemonic which I once heard: “God’s Riches At Christ’s Expense.” We talked at the clergy synod about the need to do good theology, and that simple mnemonic would be a good place to start. I am delighted to announce that on the completion of her curacy, Juliet Fraser is now assuming duties as a fellow priest-in-charge in the Shared Ministry Team for Aberconwy Mission Area. Juliet has brought considerable talent to her ministry in Rhyl and now in Aberconwy, and we welcome her to this new role. One of the many encouraging signs of life in St Asaph at the moment is the number of candidates we have for ordained ministry. God is clearly working among us, in that, subject to the discernment of God’s will, and successful formation, we are likely to be ordaining in the region of six (if not the biblical seven) deacons a year for the foreseeable future. We also have growing vocations for Licensed Lay Ministry, about which there will be more news in coming months. Do please pray for all these candidates as they prepare, God willing, for ordination in the Summer, and do also pray for more vocations to the rich variety of ministries which we authorize and promote in the diocese of St Asaph. In addition to the deaths reported in my January Ad Clerum, I am sorry to record the death of Gwynneth Parry Jones, mother of Bryn Parry Jones, on 20th December last year. Our condolences go to him, as well as our prayers. In the calendar below you will see details of the three annual diocesan confirmations (the Easter Vigil, Pentecost and Advent) to be held in the cathedral in 2019. I continue to invite mission areas to submit plans for their confirmation requirements for next year, either individually or in partnership with neighbouring mission areas. Those wishing to book a confirmation are encouraged to contact my office within the next couple of weeks to secure a date. In recent years, the numbers for Confirmation have declined sharply. Perhaps the new approach to the admission to Communion has encouraged some to think that Confirmation is no longer necessary. Please do all you can to dispel this attitude. Confirmation should now be seen in its own right, not as the gateway to something else, but as the opportunity to make a mature commitment for oneself to Christian discipleship and mission, and for Christians setting out in faith, or renewing their faith journey, to be formally recognized and welcomed as part of the diocesan family by the bishop. If we are committed to growing the numbers of disciples of Jesus in this part of the world, we should expect to see the numbers of confirmations growing. Word may have reached you concerning the various needs and requests for prayers needed in connection with the Esgobty team at the moment. Both Michael Balkwill and Siân Sweeting-Jones are currently off due to ill health. Do hold them both in your prayers. In the meantime, Canon Ian Day has agreed to act as my relief Chaplain, and will be assisting in Esgobty from time to time. A temporary secretary, Martina Siertsema, will also be employed by the RB to work with me full time here in Esgobty, but your indulgence is requested as normal service is inevitably going to be interrupted. 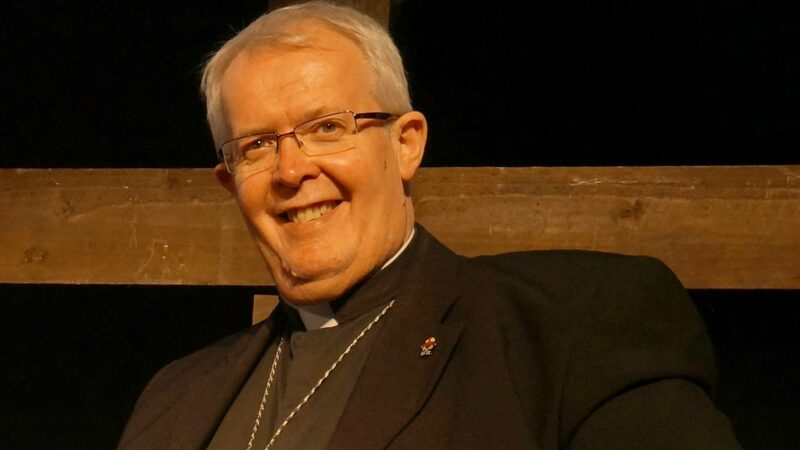 Later in the year, there will be further disruption, because the Archbishop has supported my application to take a Sabbatical this year, as not only do I reach my sixtieth birthday, but it will also be the tenth anniversary of my consecration as Bishop of St Asaph. I will therefore be taking the period July to October as a sabbatical, and not accepting engagements in the diocese, other than the Diocesan Conference. If there are dates already in the diary, then we will be contacting you shortly to indicate what provision will be made. By and large, the Dean and Archdeacons will be picking up on my role, and specifically episcopal duties will take place either in June, or after my return in November. It is always good when clergy turn out in force to support new colleagues joining the diocese, and this is true for the Installation of Canons, which will take place a week Sunday. I am sure that Martin, Steve and Kate would welcome your support in the Cathedral on 10th at 1530hr. Clergy are invited to robe (Choir dress, and in the South Transept) for this service, but we should be grateful if you could notify us of your intention to attend so that sufficient seating may be arranged. The GenRus provincial group have collaborated with the Revd. Janet Fletcher to produce an interesting and engaging Lent course on the theme of ‘Generosity and the Inheritance of Lent’. It is not just about money, but our attitude towards generosity as an aspect of Christian discipleship, and I commend it to you. The course comprises of several elements including group discussion sessions for the weeks of Lent, Holy Week and then unusually it also leads onto Ascension and Pentecost. There are various study materials which include a course booklet. Samples of the material have been made available. I need to submit an estimated number of booklets which might be required for the diocese very shortly. Do take a look at the resource and consider whether this course could be used in your Mission Areas. Please let Esgobty know if you wish to place an order for booklets, and we will feed those numbers in. Natasha Aldridge now deals with this in addition to other trusts since Karen Phillips’ departure. She asks if you receive any queries in relation to this Fund please feel free to provide her details. In addition to the provision of my pastoral chaplains, a reminder that CYNNAL, the Churches’ Counselling Service is available throughout Wales for all clergy and their families and offers one-to-one counselling interventions and ongoing support and aftercare. CYNNAL deals with all manner of problems and holds regular counselling sessions in north Wales, including Colwyn Bay and Caernarfon. If you feel CYNNAL can be of help to you, please contact them on 029 2030 2101 / or by email . Following an unfortunate spate of recent metal thefts resulting in emergency repair work, a reminder that all work to our churches should be logged onto the new online faculty system which can be found by going to the Church Heritage Cymru website. Keeping a record of work that is undertaken on the building can be very helpful – both in terms of having accurate records that can be easily accessed in the future and as useful evidence to support grant applications. Following some recent concerns that have been raised, I also have to remind you that any planned work requiring a Faculty (full or List B) must have received consent from the Registrar or Chancellor prior to the commencement of any work. Emergency repairs (examples being temporary repairs to make a roof watertight, boarding of broken windows, and security measures such as a padlock) can take place without a faculty in place but must have received written Archdeacon approval and approval from the DAC Secretary. A full faculty must be in place before permanent works can proceed. Failure to have these consents in place invalidates insurance cover (highly risky when building work is underway) and also jeopardises the future of Ecclesiastical Exemption, without which our churches would be subject to the rigours of the secular planning process. If you are in any doubt, please do not hesitate to contact our Churches Conservation and Development Officer, Rachel Cutler, or our Diocesan Churches Inspector, Michael Plane. Both are based in the Diocesan Office. I had a very good meeting last week with the leadership of New Wine Cymru. They are very keen to offer support and encouragement in evangelism and ministry to any interested clergy in the diocese of St Asaph, and their work can be accessed through their website . I should be very interested to hear from clergy who have any existing links with New Wine Cymru (which is distinct from New Wine as it operates in England), in order to gauge how best to take any relationship forward. My continued thanks to you for all that you are doing to support the work of God in our family and in north east and mid Wales, and for your ongoing fellowship.